First-year veterinary student Alannah Friedlund. Photo by Christina Weese. While growing up in northern British Columbia, first-year veterinary student Alannah Friedlund’s life revolved around sled dog racing and working with her family to maintain their kennel of Alaskan huskies. She was six years old when she ran her first race. In addition to caring for the animals, she helped train the puppies for racing and worked with her parents to maintain a productive breeding program that ensured the success of their sled dog teams. Through her involvement with the sled dogs and the family pets, Friedlund ended up spending time around veterinarians in their clinics as well as at the races. By the time she ran her first race, she’d decided that she would be a veterinarian when she grew up. At the age of 12, Friedlund contacted the University of Saskatchewan (U of S) to determine which high school classes she would need to get into veterinary school. She also set out to spend as much time as she could around veterinary clinics and animals of all sizes. In addition to working with her family’s dogs, she volunteered at a nearby racing sled dog kennel and spent some time in the Yukon on a working horse packing ranch — an experience that broadened her interest to large animals. 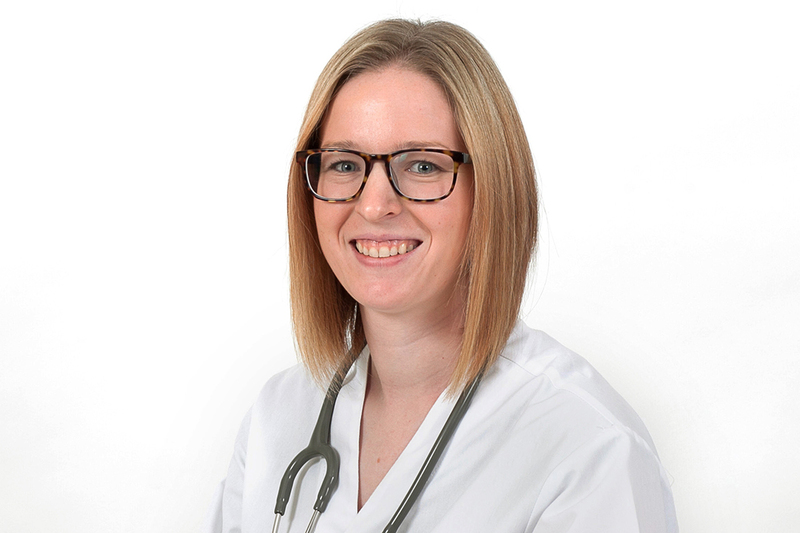 After high school Friedlund completed a Bachelor of Science in Agriculture degree at the U of S and advanced her veterinary experience by volunteering and then working at the Western College of Veterinary Medicine’s Veterinary Medical Centre (VMC). Friedlund also volunteered at the Hooves and Paws Veterinary Clinic in Elrose, Sask., where she worked with Dr. Charlotte Williams (WCVM ’94) and her staff in the clinic and on farm calls. Although she’s no longer involved with sled dogs, Friedlund’s early love for dogs prompted her to rescue a border collie named Tucker who volunteers with her on the St. John Ambulance therapy dog team. Together they make regular visits to an assisted living facility in Rosetown, Sask., where they spend time interacting with the residents. Now that she’s finally studying at the WCVM, Friedlund is enjoying the chance to meet and work with her classmates, and she’s looking forward to forming relationships that will last long after veterinary school. After graduation, Friedlund envisions working in a rural mixed practice and hopes that she can continue her involvement in sled dog racing by working as a race veterinarian. She has stayed in touch with many of the mushers she met over the years. She’s grateful for her early experiences working with the family’s sled dogs and appreciates the help and encouragement she received from her parents over the years.